"Jimmy, if Plant isn't available..."
It was one of those you-had-to-be-there gigs - The Foo Fighters playing Wembley Stadium this past June when they were joined by Led Zeppelin members Jimmy Page and John Paul Jones. And now, thanks to a DVD coming in August, you can almost feel like you were there. 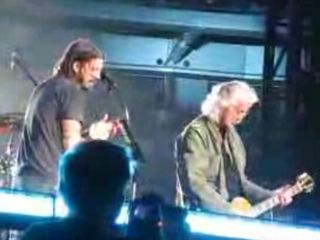 The surprise appearance by Page and Jones culminated two scalding nights of rock 'n' roll by the Foo Fighters at London's famed stadium on June 6 and 7. The DVD, titled Foo Fighters: Live at Wembley Stadium, features 18 songs from both nights, and includes the Zeppelin tracks Rock And Roll and Ramble On, which were played on the final night. The appearance by Page and Jones - a total shock to the 80,000-plus attendees - marked their first live performance since the infamous Led Zeppelin reunion in London last December, and has (of course) fueled rampant rumors of more shows to come. Foos' frontman David Grohl, visibly overwhelmed after finishing the two-song collaboration with Page and Jones, declared to the crowd, "Welcome to the greatest day of my whole entire life!"